SEREMBAN: The issue of overcrowding at government hospitals is not new and Tuanku Jaafar Hospital Seremban (TJHS) here is not spared. Negri Sembilan Health, Environment, Cooperatives and Consumerism Committee chairman S. Veerapan said, although the overcrowding situation at TJHS is not as bad as Hospital Kajang, which was reported recently, but problem has been a major issue in TJHS for the past five years. The increase in the number of patients with the high population density in Seremban, which hit 555,000 people in 2010, had meant that the daily bed usage at TJHS is also high, at 80 per cent. “Last year, TJHS Emergency and Trauma Department received a total of 151,833 patients with 14,118 categorised in the red zone, 40,510 (yellow zone) and 97,205 (green zone). The number of patients admitted to the ward last year was 44,352 patients,” he said. He said, TJHS does not practise limiting the number of patients received by the hospital and has been implementing the Ministry of Health’s (MOH) “no wrong door policy” where all patients are accepted. “In addition to the usual ward, congestion problems also occur in the emergency ward as well as wards for mothers and children. Some of the other problems faced by TJHS include lack of specialist clinics and consultation rooms for doctors and patients as well as parking problems,” he said when contacted here, today. 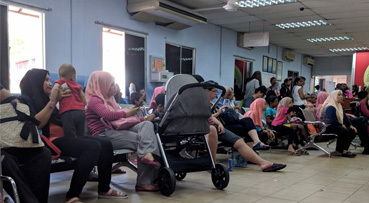 Berita Harian recently reported on the overcrowding problem at the Kajang Hospital with daily bed usage rates reaching up to 150 percent, contributing to the congestion at the ward, specialist clinics and emergency departments at the hospital. “We need a support hospital to accommodate the current needs especially in Seremban 2, Labu and Nilai areas as the population is increasing. TJHS congestion is also due to its proximity to the North-South Expressway,” he said. He added that as a short-term solution, the hospital has run a ‘lean healthcare’ management system to shorten the waiting time for patients seeking treatment by providing additional treatment rooms to accommodate the growing number of patients. “For the long-term, we are looking at the construction of a new support hospital in Bandar Enstek Nilai. A designated site is ready and we are just waiting for approval for allocation and construction. Discussions are still being made between the state government and MOH,” he said.